All excited...and don't know how to go!!! I am all signed up (Bloggy Bootcamp)...I've watched "Julie and Julia"...and I am a self-proclaimed blog junkie. Yet, with all of these things I have no idea what to write about. I am a teacher with limited craft skills looking for a creative outlet and I hope I can say that with this blog I have found it. Stay tuned for things to come. Suffice it to say that I am attempting to turn things around here at potential central and have embarked on a new crusade of eating right, Wii exercising, and holistic health. So, with my first blog post here goes my recipe for purple porridge (not really a porridge, a smoothie for the soul). Throw all of the above in a blender and frapppppppe away! So delish and a great way to start a morning! It appears that for now this is a food blog; who knows, though. The Awesomeness of a “Fiver” Party….at any age. 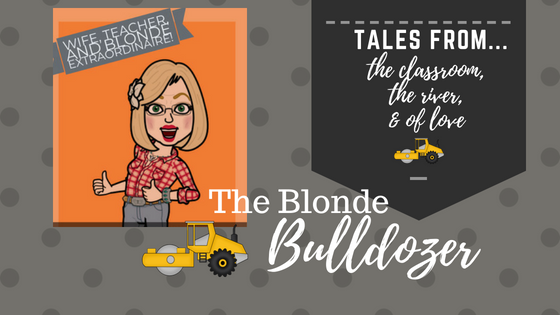 Who is the Blonde Bulldozer?